Lucas Hugie a Ranger at the Golden Spike Historical park leans on the display of a replica golden spike in a case at the visitor center located in Box Elder County. The Golden Spike National Historical Site changed status and became a Historical Park on March 12, when President Donald Trump signed the measure. 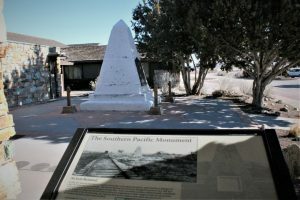 A monument at the Golden Spike Historical Park built after the driving of the Golden Spike and the beginning of the Transcontinental Railroad. The Act also creates the Transcontinental Railroad Network. The network will include sites related to the history, construction, and legacy of the Transcontinental Railroad and will be similar in makeup to the Underground Railroad Network to Freedom. One of the requirements of the change was to have an area that extends beyond a single property or building. The Golden Spike National Park includes a mix of historic and significant natural features, which made it a candidate for the change. Those natural features include the Chinese Arch, dedicated to the some 10,000 Chinese workers brought in by Central Pacific to finish their end of the rails. Then there is the Big Fill trail, which includes the railroad bed with several embankments and cuttings associated with completing the Transcontinental Railroad. Leslie Crossland, superintendent at Golden Spike National Historic Site, said they would change the signage as soon as they were instructed. Julie Blanchard, the National Park Service event coordinator assigned to the Spike 150 by the Park Service, said she has not heard if or what dignitaries would be involved the May 10 program. 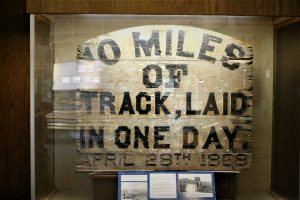 An encased sign on display at the Golden Spike visitor center located in Box Elder County shows a milestone moment when a record number of track was laid. Blanchard herself was more involved in location preparation and coordination. Lee Lonsberry, communication director for Congressman Rob Bishop, said the designation took effect as soon as the President signed it.